Moisture is important in any manufacturing process, but when it comes to hog fuel, waste fiber, wood chips, pellets, saw dust, shavings, and forest waste, excess moisture can ruin products. And what’s worse than a wasted effort? Economical losses and decreased productivity. But with today’s new technology, moisture levels are easy to control. Here at MoistTech, we’ve created the IR 3000 moisture sensor, which is a non-contact form of monitoring moisture. 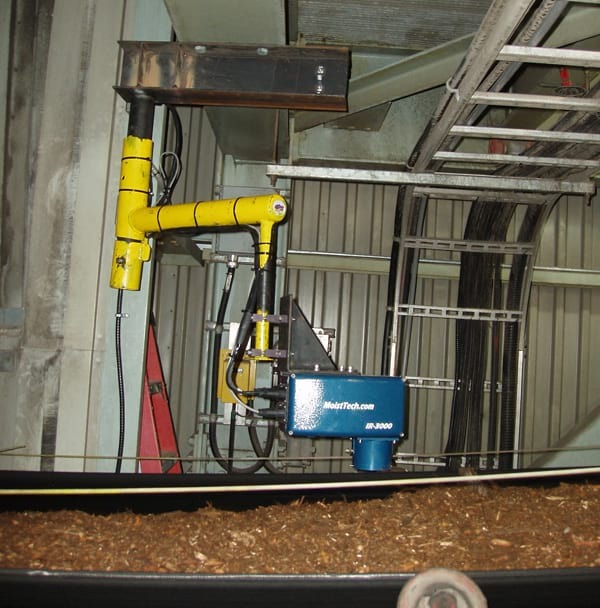 We guarantee biomass moisture testing and control from lab to line. The renewable energy moisture sensor should be installed to a sturdy support over the conveyor or processing line. Distance should range, on average, eight inches from the product. By installing sensors in this fashion, the sensor can administer continuous readings during the entire mineral creation process. This guarantees continuous monitoring of the process, which can be controlled manually or automatically. Each renewable energy moisture sensor comes standard with an optical window to prevent flying particles from caking. We recommend cleaning the optical window from time to time to prevent damaging build-up. Use your best judgment to determine cleaning dates, as the longer the particles build-up, the harder it will be to erase. MoistTech understands the requirements to successfully produce renewable energy. Our sensor calibrations, measurement wavelengths, algorithms and sensor optical requirements are pre-set at the factory. Typical accuracy is about ±0.1% moisture. Typical analog range is 0-10% moisture. The outputs can be adjusted to optimize PLC or recording requirements. To discuss your moisture sensor application or to request additional information, contact MoistTech’s headquarters for assistance.